The Cleveland Indians might be without their two biggest stars on opening day after All-Star third baseman Jose Ramirez was carted off the field Sunday. The Indians already know they’ll be without shortstop Francisco Lindor to begin the season as he works his way back from a calf injury. 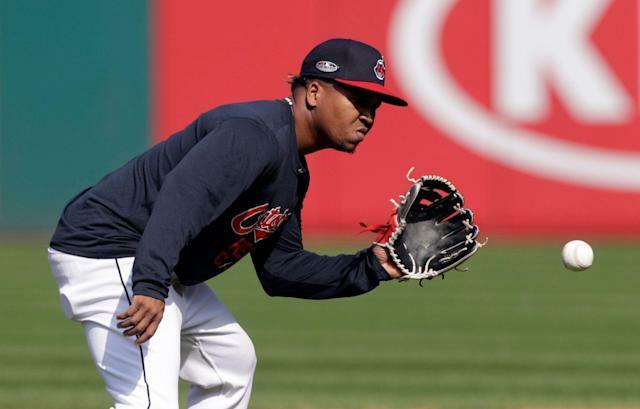 Ramirez was hurt after fouling a pitch off the inside of his left knee during the third inning of Cleveland’s spring training game against the Chicago White Sox on Sunday. X-rays on Indians star Jose Ramirez showed no signs of a broken bone, a source tells ESPN. Excellent news for Cleveland, which is already missing Francisco Lindor. Timetable on Ramirez’s return unclear but Indians breathing a sigh of relief after he fouled a pitch off left leg. The Indians are calling it a left knee contusion. That’s good news compared to the initial outlook. But the ailment could still cost Ramirez some time in the regular season with opening day four days away. Ramirez, 26, has put up MVP caliber numbers each of the last two seasons, finishing third in the voting in both. In 2017, he hit .318/.374/.583 with 29 homers and a league-leading 56 doubles. Last season, he slashed .270/.387/.552 while setting career highs in home runs (39), RBIs (105) and stolen bases (34). His 106 walks doubled his previous career best. The Indians were already going into the season somewhat vulnerable after losing 13 players from last year's roster. Even in a weaker than usual division, if Ramirez misses extended time the Indians margin for error could get thin.